The CrossFit Sport Series is an exciting new CrossFit Journal series aimed at taking CrossFitters out of their comfort zones and putting their skills to the test outside the box - literally. Trying your hand at new sports is written into our definition of fitness. The CFJSS is helping CrossFitters and other communities to get out and use the capacities that we work so hard to attain. Not to mention that any time the CrossFit Community gets together, it' s a guaranteed good time. Jimi Letchford is spearheading the effort to bring this project to life. He took the time to answer some questions on the genesis of the competition, what it's all about and how to get involved. If you missed the original video on Main site, it's available for download on the right hand navigation. CrossFit Games: Hey Jimi, thanks for taking the time to school us a little bit about the series. Jimi Letchford: My pleasure. We've been excited about this for a really long time. It's an excellent opportunity for people to get out and get involved. It's going to be a really fun time, to understate it greatly. 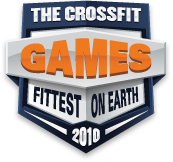 CFG: Tell us about the CrossFit Sport Series. Where was it born and what is the purpose of it? It's hosted by the CrossFit Journal; what does that mean? JL: In Greg Glassman's World Class Fitness in 100 Words, he sums up what we do as CrossFit athletes. We follow a healthy lifestyle and diet by and large. However, I can't say that all of us do the last part as religiously: "regularly learn and play new sports." The idea of the CFJ Sports Series was born in that last sentence. Because the CrossFit Journal is our resource for the lifestyle we live as CrossFitters, the CFJ will be taking the lead on hosting events around the world that encourage being a "World Class Athlete." CFG: The first event of the series is coming up quickly on September 18th. Break it down for us. How did you decide on stand-up paddling? JL: The first in the series is quickly approaching and we're very excited. Stand-up paddling (SUP) is a quickly emerging sport around the nation and world, even on lakes, rivers, and streams that are nowhere near the coasts. It requires several of the "Ten General Physical Skills" required of athletic performance. But most of all, it's a lot of fun, and that's what this series is all about. CFG: What does this competition look like and what kind of turnout are we expecting? Is it limited to CrossFit athletes? Will there be beer? JL: This event will have a sort of CrossFit spin to it. It will start with a 2000m row. You'll then grab your paddle and sprint 400m until you reach your board. 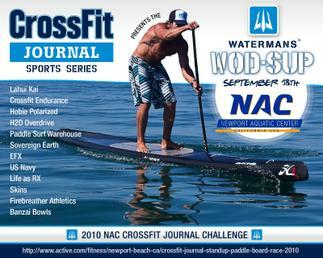 From there, you'll SUP approximately 800m before returning to shore and doing 25 burpees and a 400m sprint to finish. We're expecting 150-200 athletes of all types to participate. The competition is not limited to just CrossFitters. In fact, it's our hope to bring others in to understand how awesome our community is and to learn about what we do in CrossFit. 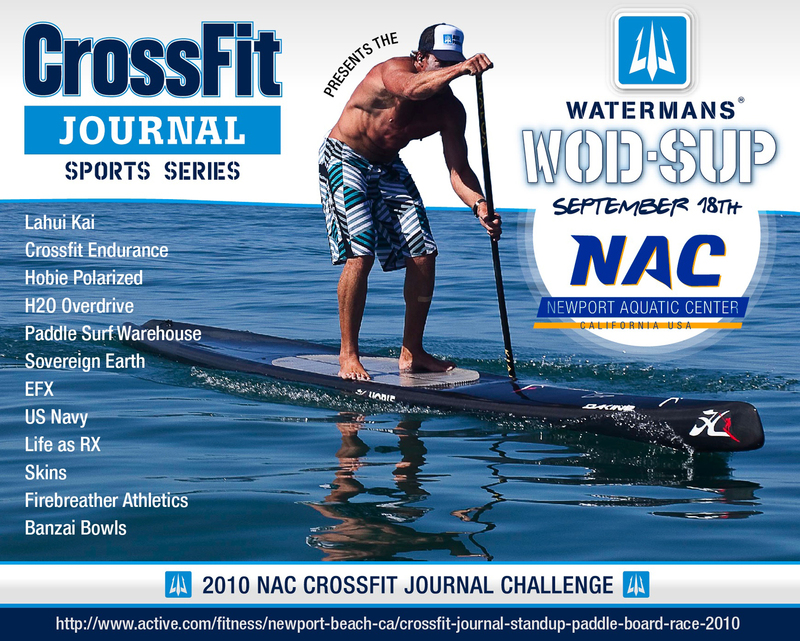 Once the event is wrapped up, CrossFit Endurance and Waterman's Applied Science will be hosting an after party in Newport Beach, CA. This will be a great opportunity to hang out with other CrossFitters. We are also expecting several professional SUPers from all over Southern California. CFG: In the video, you mention surfing Pipe. Any aspirations or would you rather see your kids grow up? JL: I'm hoping that this event and series allows the CFJ to go places that it's never gone before. I'd love to see the Journal inside the Pipe, and if it's me that does that, then I'll be looking for a more durable helmet and camera. CFG: It seemed like you were really hot during the race, you kept jumping in the water. Have you tightened up your game since the filming of this video? Seriously, though, paddleboarding looks tough! Can a person with zero experience throw themselves into the fire and expect to come out all right? Can I paddle from my knees the whole time? CFG: Can you give us a sneak peak at future events? What's on your dream list - MMA with Brock Lesnar? Noodling in Mississippi? JL: I'd love to train with Brock or any other MMA maniac. I think it'd make for an - ummmm -interesting Journal story. In the near future, a bunch of VERY recognizable athletes, along with myself, will be participating in a SEAL Fit three-day simulation of the BUD/S Hell Week. This is going to be something that Journal subscribers are not going to want to miss. But as far as the series is concerned, we're really hoping that it brings ideas, events, and relationships out of the community. For example, I'm really hoping that someone in the community has connections to get the CFJSS on a ski mountain for a down-hill ski/snowboard race day. Or a BMX track for a day of race heats. My point is, we're hoping to pull as many sports and events from the community as possible that are easy to support, but most importantly, a lot of fun. CFG: What are we playing for? Are there prizes for top finishers or is it just for 'shits and giggles'? Any speculation on who will win? CFG: Thanks Jimi, this sounds rad. We will look forward to the first installment. You can still sign up for the inaugural event . Get all the details and get signed up at Active.com today. Very cool JLetch! Thanks for everything you do to make CF better. 06 September 2010 / 12:09 a.m. Sounds rad! I live on the back of a ski resort, will see what I can do for a downhill event. 07 September 2010 / 8:31 p.m.
Hello, I tried signing up on active.com and the registraton fee is 50$ did i miss the deadline for early reg? If not no worries, I'm still going to sign up! 13 September 2010 / 10:27 p.m.
14 August 2011 / 9:38 p.m.